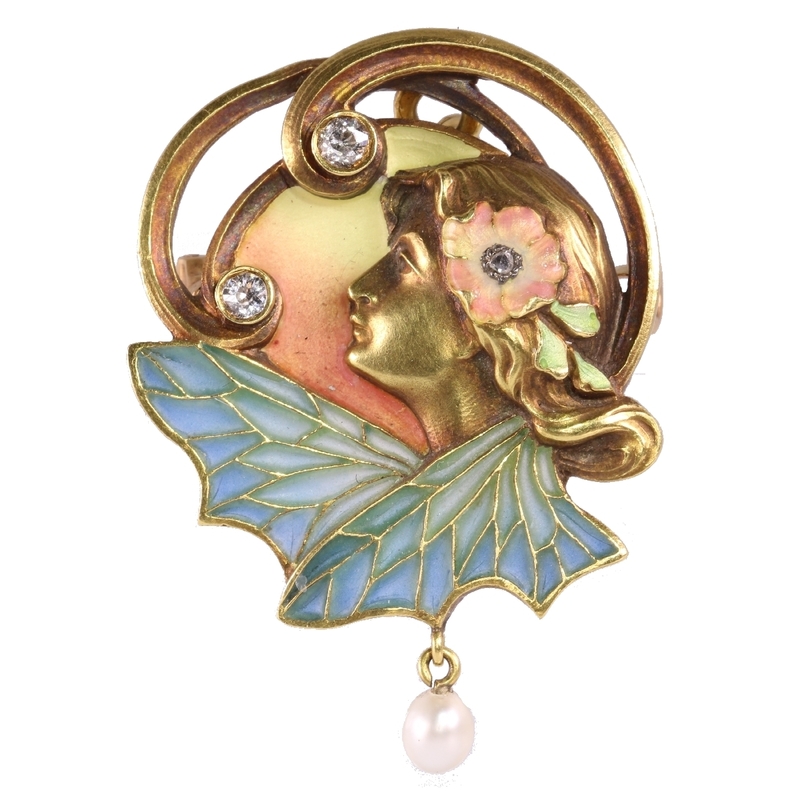 High quality Art Nouveau pendant/brooch with plique a jour enamel: Description par door Adin Bijoux Anciens. This exceptional 18K rose gold Art Nouveau pendant as well as brooch truly comes to life through the complementary enamelling around the bas-relief chased profile of a nymph. While gazing to the west, this enchanting creature sights two shooting stars made of old mine brilliant cut diamonds amidst a pink and yellow enamelled summer dusk. As a wish upon a star, a pearl embellishes the pair of plique-à-jour enamelled green and blue wings while they embrace this abloomed dame. Antique jewelry object group: Combined brooch-pendant: Although plique a jour enamel is delicate by its very nature this piece is eminently wearable. Thanks to the later addition of a loop on the back it can be worn, either as a brooch or a pendant and in the right setting it would make a truly noble conversation piece. Style specifics: Although Art Nouveau took on distinctly localised tendencies as its geographic spread increase some general characteristics are indicative of the form. A description published in Pan magazine of Hermann Obrist's wall-hanging Cyclamen (1894) described it as "sudden violent curves generated by the crack of a whip", which became well known during the early spread of Art Nouveau. Extra information: brooch and pendant - Thanks to a discreetly placed ring system in the back, this jewel can also be worn either as a brooch or as a pendant. patina - Oxidation of any surface & change due to age. A natural staining or discoloration due to aging. Diamonds: Two old mine brilliant cut diamonds with a total estimated weight of approx. 0.15 crt. and one rose cut diamond . We do not have the weight of this diamond which is normal in our trade when it comes to rose cuts.